Start planning and managing your finances in a new way-take advantage of this simple friendly calendar. 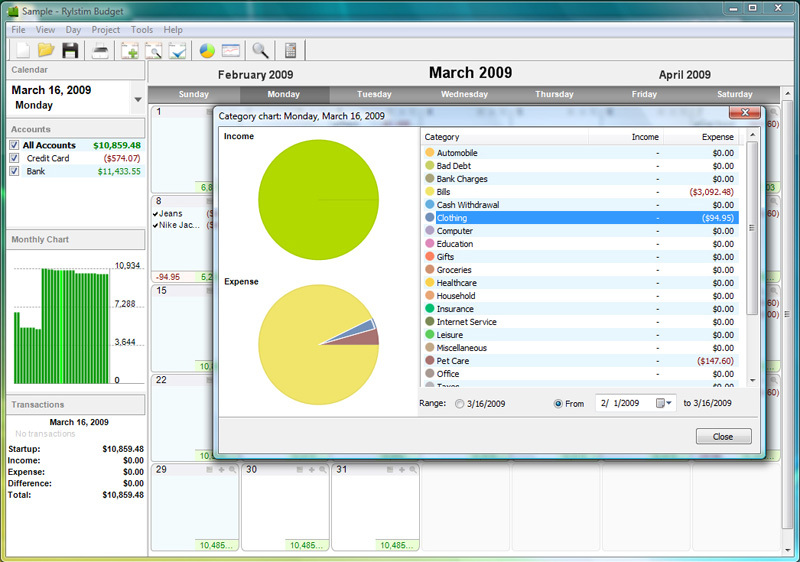 Rylstim Budget includes all necessary functions for managing money: account and category management, reporting, spotting budget excess, multiple currencies, data protection, and much more.With the calendar accounting, you can easily see your financial state for the current month, review your last month's expenses and, most importantly plan. ...... You can maintain multiple accounts simultaneously, manage different income and expense categories. You can even set limits for expense categories and be notified when these limits are exceeded. The program offers 6 different types of reports and allows using those for generating custom reports. The multi-currency support is designed to let you completely forget about any problems with transferring money between accounts in different currencies. Our idea of multi-currency appears to be unique, therefore, this is the only application where today's exchange rate for Euro differs from the yesterday's and, certainly, from the one that was current two days ago. Qweas is providing links to Rylstim Budget 4.4.1.6146 as a courtesy, and makes no representations regarding Rylstim Budget or any other applications or any information related thereto. Any questions, complaints or claims regarding this application Rylstim Budget 4.4.1.6146 must be directed to the appropriate software vendor. You may click the publisher link of Rylstim Budget on the top of this page to get more details about the vendor.